Looking for a USED 925-515? 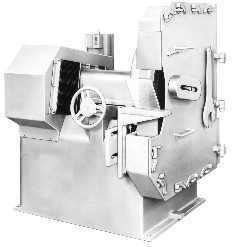 Cincinnati heavy duty, infinitely variable speed foundry snagging grinders are virtually "standard equipment" in the cleaning room. Design and construction have been perfected over many years to provide reliable, low cost service and long, trouble free life under some of the most demanding conditions imaginable. There is a wide choice of machines in both 12,500 and 9,500 SFPM models, with right and left hand types for the users' particular needs.